$250 Gas Card with purchase of new Golf, Jetta, and Tiguan. $500 Gas Card with purchase of new Atlas, Golf Alltrack, Sportswagen. E-Golf and Golf R are excluded. Discounts are not stackable. In stock units only. Offer expires November 25th. †Loyalty discount applies to Volkswagen Special Rates offered through Volkswagen Finance excluding Volkswagen Graduate and Dealer Employee Purchase program rates on select vehicles. Applicable to all eligible current Volkswagen owners and previous Volkswagen owners who leased or financed with Volkswagen Finance within the past 90 days (some exceptions apply). Offer is not available on 2017 Golf R, 2017 e-Golf, 2018 Atlas or 2018 Tiguan models. The loyalty interest rate will not be below 0.0%. Valid identification and proof of valid ownership/lease of current Volkswagen that has been active for a minimum of 90 days and in good standing is required. Volkswagen vehicles currently being financed/leased with Volkswagen Finance are not eligible for the rate reduction. Offer is transferable to Primary/Co-Primary buyer and/or another family member in the same household. Offer is non-exchangeable for cash. Offer expires January 2, 2018 and is subject to change or cancellation without notice. *Limited time lease offer available through Volkswagen Finance, on approved credit, based on a new and unregistered 2017 Tiguan 2.0T FWD Trendline base model with 6-speed automatic transmission. $1,795 freight and PDI included in monthly payment. 60-month term at 2.49% APR with monthly payments of $341. $775 lease bonus cash has been applied in monthly payment shown. $0 down payment, $390 security deposit, $22 EHF (tires), $100 air-conditioning levy, $10 OMVIC fee, $58 PPSA fee and up to $499 dealer administrative fee and first monthly payment due at lease inception. Total lease obligation: $21,144. 80,000-kilometre allowance; charge of $0.15/km for excess kilometres. ‡Up to $2,750 purchase discount available to be applied as a discount on MSRP on cash purchase only of select new and unregistered 2017 Tiguan Comfortline and Highline models. Discount varies by model. License, insurance, registration, options and applicable taxes are extra. Dealer order/trade may be necessary. Offers end November 30, 2017 and are subject to change or cancellation without notice. Vehicle may not be exactly as shown. $775 discount on MSRP available on finance purchase only (through Volkswagen Finance, on approved credit), of new and unregistered 2017 Tiguan 2.0T FWD Trendline base model with 6-speed automatic transmission. §Limited time finance purchase offer available through Volkswagen Finance, on approved credit based on a new and unregistered 2017 Tiguan 2.0T FWD Trendline base model with 6-speed automatic transmission with base ◊MSRP of $25,990 plus $1,795 freight and PDI, Financed at 0.99% APR for 84-months equals 182 bi-weekly payments starting from $154. $775 finance bonus cash has been applied in bi-weekly payment shown. $0 down payment, $22 EHF (tires), $100 air-conditioning levy, $10 OMVIC fee, $58 PPSA fee and up to $499 dealer administrative fee due at signing. Cost of borrowing is $1,015 for a total obligation of $28,651. ‡Up to $2,750 purchase discount available to be applied as a discount on MSRP on cash purchase only of select new and unregistered 2017 Tiguan Comfortline and Highline models. Discount varies by model. License, insurance, registration, options and applicable taxes are extra. Dealer order/trade may be necessary. Offers end November 30, 2017 and are subject to change or cancellation without notice. Vehicle may not be exactly as shown. *Limited time finance offer (available through Volkswagen Finance, on approved credit), available for select 2011 M.Y and newer models and 2010 M.Y. City models. STD rates apply for other models. Rate varies depending on term selected. STD means the non-subvented, standard finance rate available at the time of purchase. Financing example: $10,000 financed at 0.9% for 24 months, monthly payment is $421, cost of borrowing is $94 for a total obligation of $10,094. Dealer may sell for less. Down payment or equivalent trade-in, due at signing, may be required. PPSA or RPDRM registration fee, license, insurance, registration, duties (where applicable), options, any dealer or other charges and applicable taxes are extra. Offer ends November 30, 2017. Certain conditions apply. ‡The VW Select Program is a financing offer available through Volkswagen Finance on approved credit. Not available in Quebec. The VW Select Program offers fixed monthly or bi-weekly payments for the term selected and a final (balloon) payment of the balance due at the end of the term. Available for the following fixed terms: 24, 36, 48 or 60 months. The maximum amount of the final payment depends on the length of the term selected (50%/45%/35%/25%) of the financed amount. The amount of the final payment can be decreased at the customer’s option; this will result in higher monthly or bi-weekly payments. 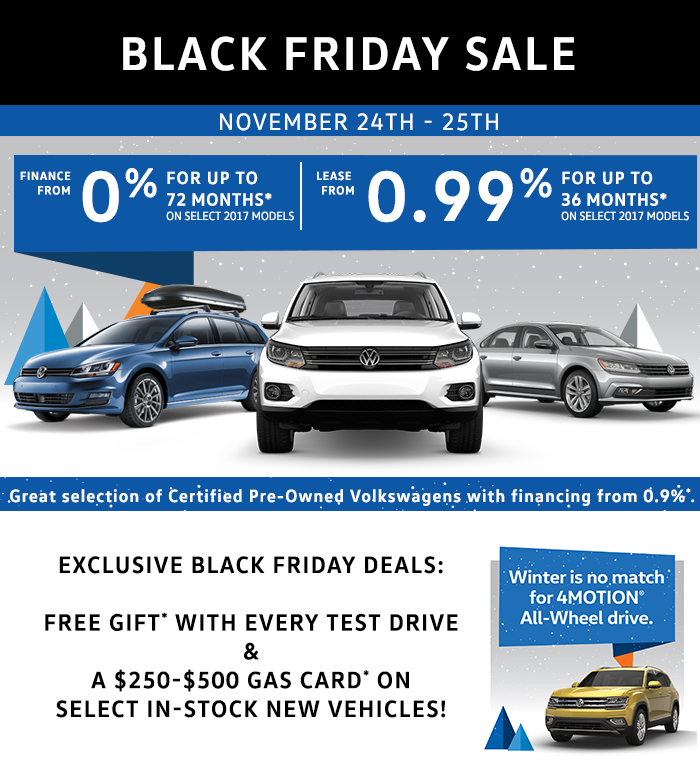 See your Volkswagen dealer for details.